Ireland’s junk ensemble performs “Dusk Ahead” this weekend at La MaMa. Photo by Luca Truffarelli. 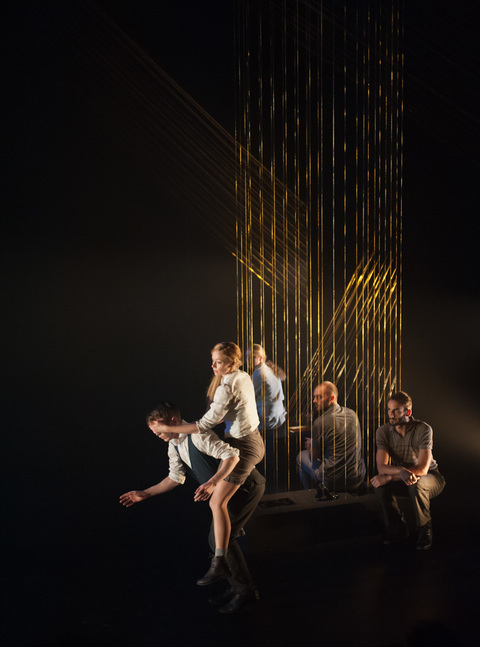 After a critically acclaimed run in Ireland, the Dublin-based troupe junk ensemble brings their imaginative dance theatre piece “Dusk Ahead” to La MaMa. Exploring the unknown grey area between reality and imagination, the talented cast will act, dance, and provide the work’s musical accompaniment. Where the old world meets the new: Paloma McGregor at BAAD! Inspired by her 89-year old father’s fishing traditions, Paloma McGregor’s long-term project “Building a Better Fishtrap” asks, “What happens when you leave your ancestral home?” Questions of history, place, and memory arise in the latest version of the work, which will be presented at the Bronx Academy of Arts & Dance this weekend. Now a beloved annual tradition, DanceAfrica returns to the Brooklyn Academy of Music for a week full of African and diaspora dance, music, and film. Led by the bombastic Dr. Chuck Davis in his last year as the festival’s Artistic Director, this year’s theme celebrates Afro-Brazilian culture with a featured performance by the Brazilian dance company Balé Folclórico da Bahia alongside many New York-based groups. Visit BAM’s website for a complete listing of program dates and times.